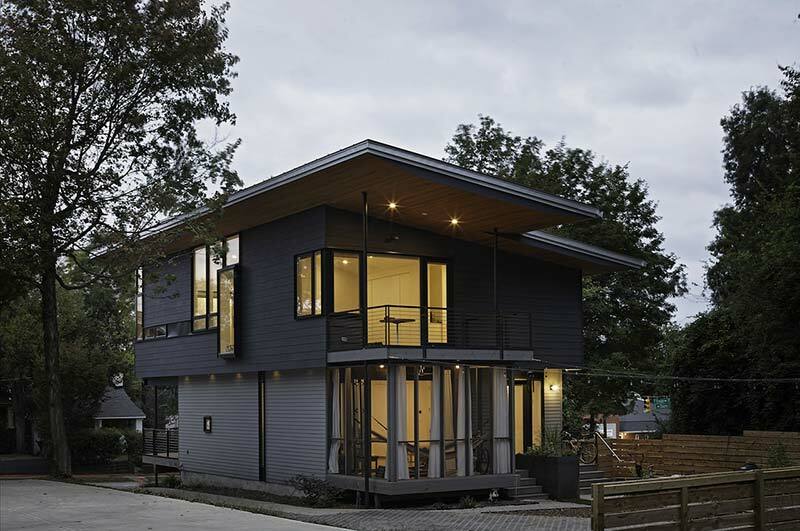 Journal — Raleigh Architecture Co.
Two new compact houses introduce a modern, sustainable, infill-housing model to an old, urban neighborhood, while providing two young families with open, efficient homes perfectly suited to their individual lifestyles. Each home blends in with the neighborhood, but features a bevy of sustainable features, like locally-sourced recycled exterior materials, plenty of natural light and clever design that merges the interior of the homes with the world outside. 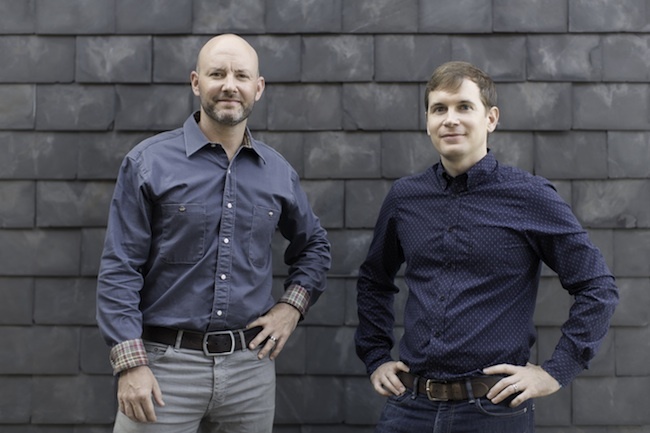 Robby Johnston and Craig Kerins, co-founders of The Raleigh Architecture Company (RACo) on South West Street, can point to several projects they’ve completed in downtown Raleigh within the three years that they’ve been professional partners. On Hargett Street, Nuvonivo, a children’s clothing boutique, and Arrow Haircuts, a hip take on an old fashioned barber shop, sit side-by-side. On Hillsborough Street, they designed Runologie, an independent running supply shop, and State of Beer, a craft beer bar and bottle shop. Then there’s Crank Arm Brewing on West Davie Street and, by the end of this summer, Standard Foods market and restaurant on Person Street. These projects are independent, but they resonate with RACo’s design sensibilities: They’re all “up-fits” in challenging spaces within old, existing buildings — a form of sustainability the partners encourage and enjoy. They’re also characterized by clean, uncluttered spaces, innovative uses of everyday materials, and deceptively simple solutions that generate a lot of surprise per dollar. An award-winning Modern home in Raleigh’s old “Hungry Neck” neighborhood, designed and built by The Raleigh Architecture Company (RACo), will be open to the public during the sixth Residential Tour sponsored by the Triangle Section of the American Institute of Architects’ North Carolina chapter (AIA Triangle). 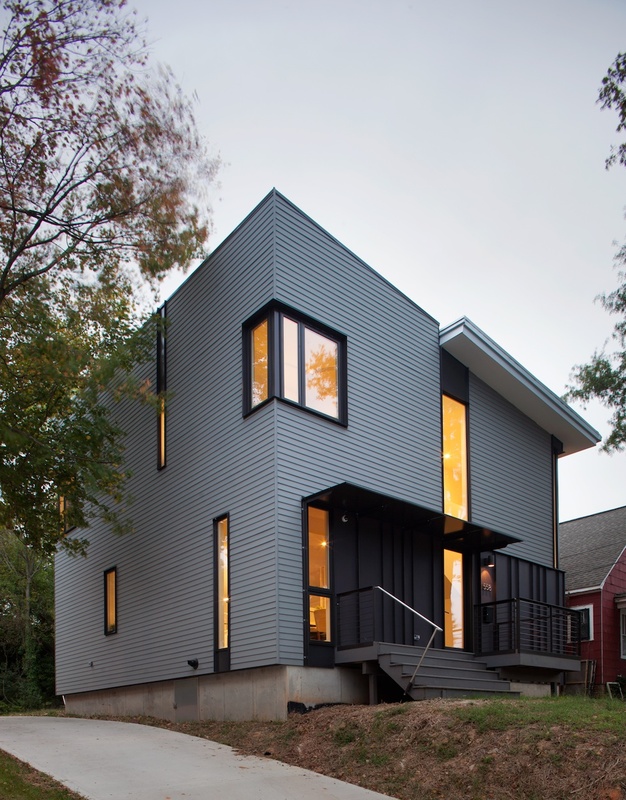 The tour will take place on Saturday, September 26, from 9 a.m. to 5 p.m.
One of only seven residences selected for the 2015 tour, the Hungry Neck house received an AIA Triangle honor award for design excellence and construction quality this past spring. “Honor awards are granted to projects that exemplify excellence of architectural design on all levels of analysis and are reserved for those projects that stand out,” said design jury chairman William Carpenter, FAIA, of Decatur, Georgia. This house is actually one of a cluster of compact modern houses in the old neighborhood just east of downtown Raleigh. Designed by RACo partners Craig Kerins, AIA, and Robby Johnston, AIA, it perches on an infill lot overlooking a busy thoroughfare. In the spirit of the neighborhood, the partners turned a corner of the façade into a front porch. The owner is a chef by avocation, so the interior revolves around cooking and entertaining. A light-filled, double-height space in the center of the house connects the open kitchen to the rest of the house. At the rear of the house, large operable glazing lets the dining room expand outside and focuses the view on a 100-year-old oak tree. A balcony off the master bedroom suite provides outdoor living space on the second floor. AIA Triangle encompasses members in Wake, Durham, Orange, Lee, Chatham, Franklin, Warren, Vance, Granville, and Person counties. The houses on the 2015 tour are located in Raleigh, Durham, Creedmoor, and Pittsboro. The young firm’s partners will represent an emerging and innovative design-build practice. Robby Johnston, AIA, and Craig Kerins, AIA, founders and partners of The Raleigh Architecture Company (RACo) in Raleigh, will discuss their design-build work during the American Institute of Architects’ Winston-Salem section meeting on Tuesday, May 19, beginning at 12 noon in the Milton Rhodes Center for the Arts in downtown Winston-Salem. According to section president Jason Miller, AIA Winston-Salem has developed a “dual-pronged approach to section meetings: one focused on policy issues…and another devoted to emerging and innovative practices from across the state.” The RACo partners will represent the Triangle area for the latter theme. Miller said he’s particularly interested in RACo’s work since he teaches in and practices through the “design-build-centric” Building Science program in Appalachian State University’s Department of Technology and Environmental Design in Boone, NC. Johnston and Kerins founded The Raleigh Architecture Company and The Raleigh Construction Company, in the Warehouse District of downtown Raleigh in 2012. Since then, the young firm has completed 15 Modern residential projects and 15 commercial projects, including retail up-fits within existing historic buildings from Raleigh to Asheville. Kerins also designs and hand crafts Modern furniture. For more information on AIA Winston-Salem, visit www.aiawinstonsalem.org. RALEIGH — When Craig Kerins and Robby Johnston began building a cluster of modernist homes on Edenton Street a few blocks east of downtown, the architects knew they were tapping into a shift in attitudes among the homebuying public. But the five homes – which feature large overhangs, big shared spaces filled with light from 9-by-9 windows and skylights – were all done on commission and would not be listed for sale. That is not the case for their latest project, a trio of similarly designed houses that are now going up on Wynne Street a block from Chavis Park. While a small sample size, Kerins and Johnston’s work is a sign that many of the defining characteristics of modernist architecture – open plans, numerous windows, and easy accessibility from inside to outside – have become features prized by many of today’s homeowners. READ MORE.. When Standard Foods opened in downtown Raleigh’s Person Street Plaza this fall, owners John Holmes and Scott Crawford finally revealed their vision for an all-locally sourced, farm-to-table grocery store and restaurant, both of which celebrate “the food, farmers, and artisanal production methods of our region,” according to the website. Within the Plaza, a redevelopment project that includes Raleigh City Farm, Yellow Dog Bakery, and other locally owned businesses, something else happened. Standard Foods’ physical space revealed The Raleigh Architecture Company’s interpretation of a shopping and dining experience that is at-once modern, urban, and artisanal. A few months earlier, while the project was still under construction, John Holmes told the Independent Weekly, “We want the design to reflect what we’re trying to do with the food.” With that in mind, he and Crawford turned to Craig Kerins, AIA, and Robby Johnston, AIA, of The Raleigh Architecture Co (RACo), a local firm well known for custom retail designs and quality craftsmanship. Ted Van Dyke of New City Design served as architect of record for the project with RACo as design architect for the front-of-the-house (areas open to the public) and the exterior. Standard Foods is a 3000-square-foot grocery store, butcher shop, and 80-seat restaurant. The restaurant side features a 26-seat communal table and a 16-seat bar. Outside, weathered steel slats trace the upper edge of the one-story, matte-charcoal exterior and provide shading for large windows that frame views of the Raleigh City Farm 20 yards away. Eventually the slats will also support plantings to add more shade and elements of the farm to the façade. Part handcrafted, part sophisticated, the total design creates a distinctive identity for Standard Foods. Inside, market and restaurant spaces flow into each other and the matte-charcoal reappears on background walls that enhance natural sapele wood and slate wall panels in the market, and heart pine tables and chairs in the restaurant. Metal refrigeration cases gleam under energy-efficient lighting, and accents of marble and leather add upscale elements to the simple, natural materials. Part handcrafted, part sophisticated, the total design creates a distinctive identity for Standard Foods. Yet the colors and textures of the food – in the market or served on the tables – are the main attractions. To ensure a community-oriented shopping experience, the aisles in the grocery store area are tight, reminiscent of an urban bodega. The spacing creates an intimate experience with the products. Benches between aisles encourage shoppers to linger. Inside, large windows frame views of the Raleigh City Farm 20 yards away. Standard Foods is a joint venture between Holmes, the president of real estate firm Hobby Properties, and Crawford, the former chef of Herons at The Umstead in Cary and twice a James Beard semifinalist for Best Chef in the Southeast. The men call their partnership The Nash Hospitality Group. For more information, go to standard-foods.com. The Raleigh Architecture Co. is frequently commissioned for urban up-fits in existing buildings in downtown Raleigh. A few of the partners’ completed projects include Arrow Haircuts and NuvoNivo on Hargett Street, Runologie and State of Beer on Hillsborough Street, Trophy Brewing Company on Maywood Avenue and Crank Arm Brewing Company on West Davie Street. The Raleigh Architecture Co. adds new single-family homes to old urban neighborhood. The Raleigh Architecture Company (RACo) has completed the final three houses in a cluster of modern, compact, single-family homes within the old “Hungry Neck” neighborhood just east of downtown Raleigh. Each of the five urban-infill houses – including the original two on Edenton Street — is specific to the owners’ needs and lifestyle, yet they share certain design sensibilities. Each sits on a small buildable area on its lot. That plus tight zoning restrictions suggested compact linear footprints and projecting forms. Front porches, shaded by cantilevered second floors, link the homes to the community and reinforce the existing vernacular. Each house is sited on its lot to maintain the way other houses in this neighborhood address the sidewalk and street. All five houses are filled with an abundance of natural light. A series of skylights and high glazing brings light and views into the central space of the new 2000-square-foot Kwon house (above), which happens to be a spacious, double-height kitchen. The owner is passionate about cooking and entertaining, so the dining space flows off from the kitchen and can extend outside on a covered deck. Large roof overhangs shade the windows and cover the balcony off the master bedroom suite upstairs. For the 1770-square-foot Floyd house (above), two thin, double-height spaces connect the lower floor to the upper story on the northern and southern elevations. A thin shed roof creates a large overhang on the southern elevation and covers a walk out deck. In keeping with the owners’ desire for a clean, minimal interior, crisp white walls rise from blackened oak floors. Privacy was a key component for the design of the Powers house (above), located on what was a vacant corner lot. A cast-in-place concrete wall adjoining the house creates a private courtyard that shields the house from the busy street nearby. Carefully arranged windows fill the interior with an abundance of natural daylight yet maintain the owners’ privacy. Inside and upstairs, a steel walkway, visible from a double-height space below, connects the two upper bedrooms. All five houses feature concrete foundations, custom wood trusses, steel columns that allow large spans and spaces inside, high efficiency HVAC systems, European-style cabinetry, and solid oak floors. The Raleigh Architecture Company (RACo) recently completed the design and construction of Trophy Brewing & Taproom at 656 Maywood Avenue in Raleigh following the success of the firm’s design for the smaller State of Beer bar and bottle shop that opened on Hillsborough Street in 2014. For their new location, owners David Meeker, Chris Powers, David Lockwood, and Les Stewart asked RACo partners Craig Kerins, AIA, and Robby Johnston, AIA, to transform an existing steel-framed metal warehouse in a post-industrial area of the city into a 12,000-square-foot, 20-barrel production facility. The new facility includes an 8000-square-foot brewery fully visible from the 800-square-foot taproom, a barrel aging room, a keg cooler, office spaces, and a large outdoor patio. In the brewery, three single-batch fermenters and three double-bath fermenters provide approximately 180 barrels of fermentation space. A reinforced foundation slab supports the weight of the equipment. The partners also had to enlarge the structure’s gas and water supply systems and install extensive floor drainage systems. Continuous floor-to-ceiling storefront glazing provides a clear view inside the brewery from the taproom. The partners emphasized the visual connection with an angled furniture plan, a continuous solid white oak bar top between the taproom and brewery, and a custom-crafted white oak ceiling in the taproom, also applied on an angle. According to Johnston, the exterior of the taproom is wrapped in natural white oak that folds into the taproom ceiling over the bar and in contrast with the room’s dark interior. Including the black-stained white oak bar base, the design scheme is “reminiscent of the exterior versus interior of wine and bourbon barrels used in the aging process: The exterior is left natural and the internal is charred to enhance flavor.” The natural and black-stained oak overlap at the 16-seat bar “where you experience the beer,” he added. The partners also specified metallic gold paint to recall the gold or bronze sheen of the facility’s namesake: trophy. An aluminum-and-glass garage door and storefront glazing also make the brewery operation visible from the patio and the street. Among other special features are polished concrete floors in taproom, a custom-designed terrazzo tap surround, and custom-designed steel water jet sleeves. The architect of record for Trophy Brewing & Taproom is David Mauer with RACo serving as design architect and The Raleigh Construction Company as contractor. THE RALEIGH ARCHITECTURE Co. ©2019 No reproduction of any content without permission.